When Seymour Thompson celebrates his 100th birthday next week, his family expects nearly 200 of his friends and family to be in attendance. After all, 100 years is a long time to build friendships, especially for a man who always loved his social life and his ties with the community. Seymour Thompson will turn 100 in December but will celebrate his centennial birthday on Saturday. On Saturday, Nov. 27, the Thompson family will throw an open house party for Seymour in the new fellowship hall at Nordland Lutheran Church. Though his birthday isn't until Thursday, Dec. 22, Seymour's family planned the event for maximum attendance, since Seymour loves a party and being among his friends. Having the party so close to Christmas may have made it difficult for some people to come, they thought. Also, more friends and family will be in the area over the Thanksgiving weekend. Seymour was born in 1904, on the same Union Grove Township farm his own father started when he came from Norway. Seymour married Mabel, his wife of 75 years, in 1927, and the couple had three children: Lloyd (Bud), Lorraine, and Delores (who died at the age of three). The family raised livestock and crops on the farm until the mid-1960s, when they turned over farm operations to Bud. When Seymour started farming, things were a lot different than when he quit. Instead of tractors and combines, Seymour started farming with horse-drawn equipment. Life could be difficult on the farm, but Seymour's grandson, Jeff Thompson, believes Seymour handled difficulties with a positive attitude and a dose of his quiet "Norwegian humor." Seymour once told his grandson, Rick Thompson, who now lives on the family farm, a story about mowing hay with a horse-drawn sickle-mower. Things were going well when a pheasant frightened the horses. The horses threw Seymour off the mower and bolted for the stable with the sickle still down. Along the way, the sickle hit a windmill, which seemed O.K. at the time, but a big wind blew it over a few days later. One of Seymour's favorite hobbies is fishing, shown in this 50s photo. At the time, Rick doubts that his grandfather laughed about the incident, but later he would smile as he recounted the incident, said Rick. He noted that his grandfather never dwelled on negative things, which may be one secret to his long life. The horses gave way to tractors in 1934 when Seymour bought a John Deere B tractor with big steel wheels. Seymour keeps a model of the tractor on his dresser at the Koronis Manor today. 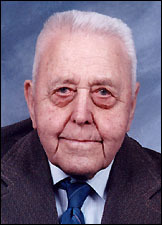 As a young man, Seymour was active in the Paynesville Farmer's Union, the local DFL party, and in his community. Jeff, who is mayor of Paynesville, and Rick, who is chairman of the board in Union Grove Township, both believe their grandfather taught them the value of hard work and commitment to the community. Though he wasn't a stern man, they always listened to him because he was fair. During the 1960s, after retiring from farming, Seymour and Mabel worked as the caretakers for the Koronis Regional Park. When he wasn't working - either on the farm or in the community - Seymour took pictures, a hobby he developed after getting his first camera as a boy. He spent hours recording his memories - using photos and newspaper clippings - in photo albums and scrapbooks. He keeps dozens of the books in a cabinet in his room today. 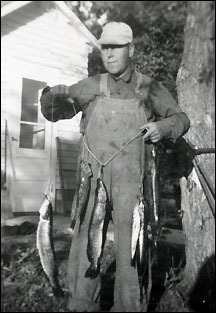 Seymour also liked to fish, and he loved cooking, passions he combined during fishing trips to Canada with friends. "They only took me because I could cook," said Seymour with a grin. When they were young, Seymour and Mabel liked to go dancing, according to Seymour, and they enjoyed entertaining their friends. Because they both loved cooking, friends were always welcome to drop in at any time - day or night - for coffee, treats, or a meal. And they often did, said Rick. "They were always going," said Jeff, noting that being around other people has always been important to his grandfather. Even after Seymour was unable to walk easily because of his bad hips, he still insisted on going to the state fair every year, if only to sit on a bench and watch people. Now Seymour's life is quieter. He lives in the Koronis Manor, where he shared a room with Mabel until she died last year. He still spends a lot of time working on his scrapbooks and albums, and he would like to go fishing, an activity he misses since it became difficult to climb into and out of a boat. He still attends services at Nordland Lutheran Church - where he was baptized and is a lifetime member - whenever he can. But he's really looking forward to his 100th birthday party, said Rick, mostly because he will get to see family and friends, some of whom he hasn't seen for a while.